Now this is a reoccurring theme in some of my dreams, ill tell you this is worst one. ZOMBIES! the first really bad dreams i started having were of zombie's and im not talking about the old 1960's night of the living dead zombies covered in mud and painted blue, im talking about half rotted stinking hungry blood covered guts hanging out corpses! in this particular dream im in a strange city. and there are tens of thousands of these dead people running around. imagine a huge rock concert and seeing that crowd and now, imagine their all dead and they want to eat you. well im being chased by them all through this city and im with strange people. i dont know who they are but were fighting these zombies as hard as we can. and we got weapons. this is like something from dawn of the dead. and to tell you the truth i love that movie but this is different i actually feel like its really happening. and no i dont watch too many zombie movies. well after awhile of fighting side to side with these people they start dying off. im the only one left and i cant possibly kill all the zombies with the one weapon i have. so basically at the end im eaten alive and its the last thing i feel before i wake up. this dream really screws with my head and these types of dreams happen alot. i was hoping to see what your thoughts on this dream is. Interest in gothic fiction which combines both the romance and horror genre peaks in adolescence and early adulthood. Gothic fiction often used a dream as a plot device to move the narrative of the story along. 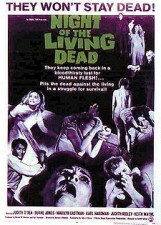 The horror film Night of the Living Dead is certainly a cult classic. Dawn of the Dead is another such zombie, blood and guts genre film. The latest addition to the zombie canon of film is Zombieland (starring Woody Harrelson) it fits the description of your dream. What really gives away the cliché plot and the kitch imaginative aspect of your flesh eating zombie dream is the huge rock concert. How could anyone not see the greatest popular culture music video ever made in that image? Most everyone (who knows something of music videos) reading this dream would immediately see Michael Jackson's romantic horror story Thriller (enjoy the artistic thrill). Your dream, does provide some of the right imaginative ingredients for a horror film. You say you are in a strange city with strange people, from a psychological perspective we are talking about "stranger anxieties". "It's not safe out there." Stranger anxiety has its dramatic developmental peak when the child is about 1 year old. From a children's literature perspective the fairy tale of Hansel and Gretel personify these fears of children in the person of the canibalistic witch. If separation-individuation development is arrested and the child fixates on these insecure feelings they can develop into full blown xenophobia. Hitler played on German fears surrounding the Jews. During the Cold War, Russian spies were believed to be lurking everywhere in America. The global war on terror has generated new fears.